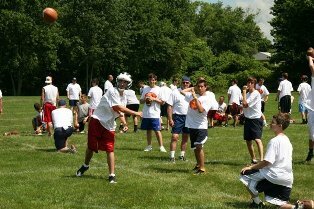 Quarterback and Wide Receiver Camps is a non-contact teaching camp for high school seniors, juniors, sophomores, freshmen and youth players. We provide small group instruction dedicated to training Quarterbacks, Wide Receivers, Tight Ends and Running Backs in passing offenses. QBR Camp is four days and three nights of fundamentals-based, football skills training sessions in California, New Jersey, Arkansas, Georgia and the Midwest. We stand alone as the best summer football camp in the nation! Quarterback and Receiver Camp specializes in the training of high school athletes (grades 9-12) and youth football players (grades 6-8). Quarterback and Receiver camps 2017 encourages players to attend our four-day, three-night camp to learn the proper fundamentals and techniques to prepare them for their junior high school, high school and college football careers. Quarterbacks, Receivers and Running Backs in passing offenses will receive the EXACT same instruction regardless of their age. Both youth and high school players will be instructed in small groups with a ratio of one coach for every ten campers. They will have nine on-field practices and five position meetings during the four days at QBR camp. However, QBR Football Camps 2017 expects that the youth players who attend camp will be mature enough to spend three nights in a college dormitory room and socialize with other youth players, as well as possess the strength, stamina and attention span to fully participate in all QBR Camp activities. QBR Camp is NOT a babysitting camp. We want only players who are willing to work hard and learn the proper fundamentals and techniques and who are COACHABLE.